Last Month the US State Department issued its Annual Study on Human Rights Around the World. It identified Eight Nations that have either used or recruited Child Soldiers. Of the eight countries listed six of them Received Military Assistance from the United States. First of all what is the proper definition of a Child Soldier? It is easy to describe. A Child Soldier is basically anyone under the age of 18 that is an active participant in an Armed Conflict. Of the Eight Countries that were found to have either actively used or recruited Child Soldiers the following African Countries made the list. The American Military Spends Millions of Dollars in these Countries. Should we spend money where Children have their Lives Stolen? The United States has sought to protect Children in War Zones. But it appears on the surface that this may not be entirely accurate. There have been some movement in Conflicts where Child Soldiers have played a Prominent Role. 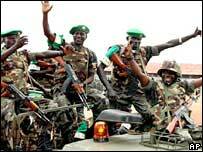 A Peace deal Between the Lord's Resistance Army and the Ugandan Government is expected to be signed at any moment. Attempts to rein in the Various Militias in the Eastern DRC Continue at this time. A EU Peacekeeping Mission is moving into place along the border between Chad and Sudan. Sadly there is no credible Information regarding the CAR.